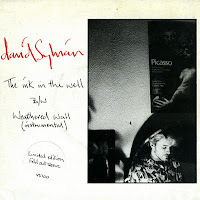 David Sylvian released his first solo album in 1984, after the breakup of his band Japan. The album featured the hit single 'Red guitar', but two further singles were released. The second single, 'The ink in the well' was released in August 1984 and reached number 36 in the UK singles chart. A limited edition featured a foldout sleeve with photography by Anton Corbijn. The song itself is a wonderfully textured, organic kind of track, the kind of music David Sylvian would continue to make with ever less chart success. Perhaps the most striking feature of this single is the sleeve, being all white with punched out letters on it. 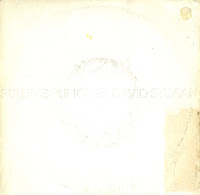 It was the third single from David Sylvian's debut solo album 'Brilliant trees'. 'Pulling punches' reached number 56 in the UK singles chart during a two week chart run. 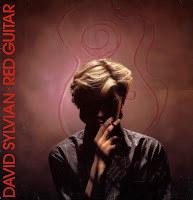 'Red guitar' was David Sylvian's biggest solo hit, peaking at number 17 in the UK singles chart. It was a track on Sylvian's debut solo album 'Brilliant trees', which featured guest musicians Danny Thompson, Ryuichi Sakamoto and Holger Czukay. 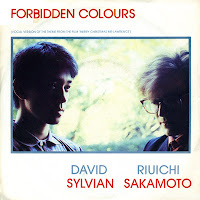 The B-side is a new recording of the Sylvian & Sakamoto track 'Forbidden colours', which was originally featured on the soundtrack of the movie 'Merry Christmas Mr. Lawrence'. 'Forbidden colours' is the vocal version of the track 'Merry Christmas mr Lawrence'. The lyrics were written and performed by David Sylvian, who had worked with Riuichi Sakamoto once before on the single release 'Bamboo houses'. This single peaked at number 16 in the UK singles chart. Since the release of this single, both Sakamoto and Sylvian have recorded several interpretations of the song, both instrumental and vocal. An orchestral version featuring vocals by Sylvian was included on Sakamoto's 1999 album 'Cinemage'. In 1989, I bought a 3" cd-single featuring Sylvian and Sakamoto's wonderful collaboration 'Forbidden colours', recorded for the movie 'Merry Christmas Mr. Lawrence'. 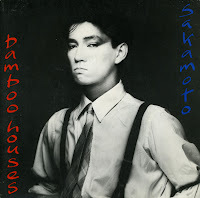 This cd-single also featured two further tracks: 'Bamboo houses' and 'Bamboo music'. I didn't know this, but these tracks were actually the first collaboration of the two. 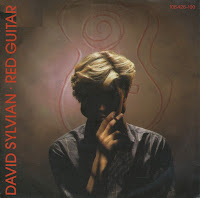 It was Sylvian's first 'solo' project, released while still in the band Japan, which he left two years later. This single, featuring the same two tracks, was released in 1982 in a gatefold sleeve. The single peaked at number 30 in the UK singles chart. After spending a decade in the band Japan, David Sylvian released his debut solo album 'Brilliant trees' in 1984. The album was split in two parts: the more accessible tracks were on side A of the album, whereas the more experimental work was grouped together on side B. The biggest hit from this album was 'Red guitar', which reached number 17 in the UK singles chart in the Summer of 1984. Originally I dismissed this single as 'boring', but after a while I still became interesed and bought the 7" single. Years after that, I bought the 12" single because I had become curious what the 'full length version' would be like. As it turns out, it is actually the album version. But since I don't have the album, this will do nicely.